Intense 4-Person Dome Tent with Porch | BUDK.com - Knives & Swords At The Lowest Prices! Perfect for family outings, the Intense 4-Person Dome Tent provides a spacious, secure refuge from the elements for multiple campers, comfortably accommodating four full-sized sleeping bags or even a king-sized air mattress with ample room left over for clothes, water, flashlights and other supplies. It even includes a nearly-4' long, fully enclosed "front porch" with a large roll-up mesh door for leisurely enjoying the wild, completely protected from disease-transmitting mosquitoes and other flying pests. The porch is also great for stashing muddy, wet clothing or gear, allowing soggy items to dry without soiling your clean, dry sleeping area. When not in use, both the main tent and porch add-on roll up tightly and pack away in a compact carry bag for easy transport. No matter where your adventures take you - craggy mountain ridges, sun parched deserts, windy beaches and more - the entire family can rest easy in this tough, cozy "home away from home." The outdoor gear experts at Intense carefully engineered the 4-Person Dome Tent to withstand the rigors and challenges of a wide range of environments. 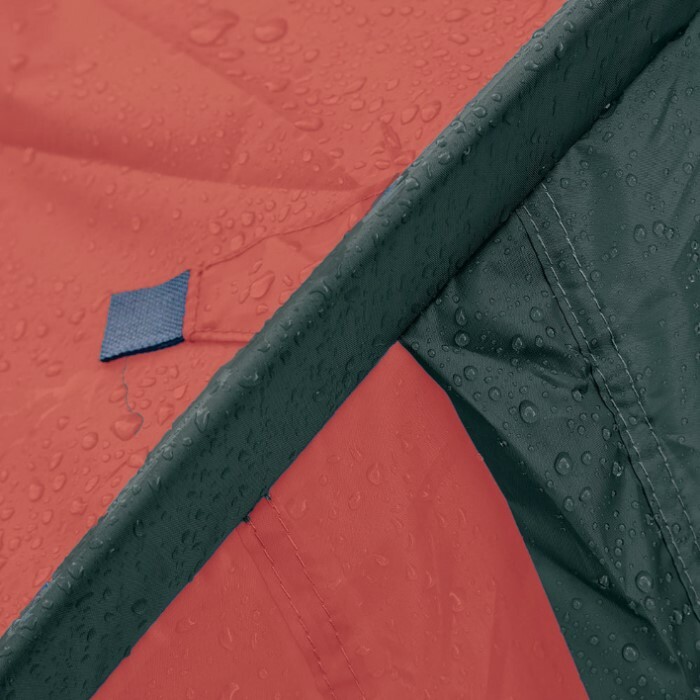 Covered zippers, shielded seams and a sleek, angular profile ensure that not a single drop of moisture makes its way into the tent's interior, even during the most torrential downpours. Furthermore, the ultradurable, rip-resistant polyester shell features an advanced weather-resistant coating that wicks away moisture and guards against damaging UV radiation. With its tenaciously strong fiberglass pole frame and included steel ground stakes, not even 30+ mph winds can bring down this rock-solid portable shelter (when properly anchored)! And speaking of wind, setup is a "breeze," thanks to snag-free, continuous pole sleeves; easy snap-on pole suspension; and handy ring pins that keep poles firmly planted in the corner rings without slipping. Integrated windows and ground vents increase air circulation, keeping you cool and comfortable. There's even multiple interior storage pockets for stowing electronics or other gear and a handy interior hook for hanging clothes and the like. Best of all, you don't have to pay a premium price for all these premium features. 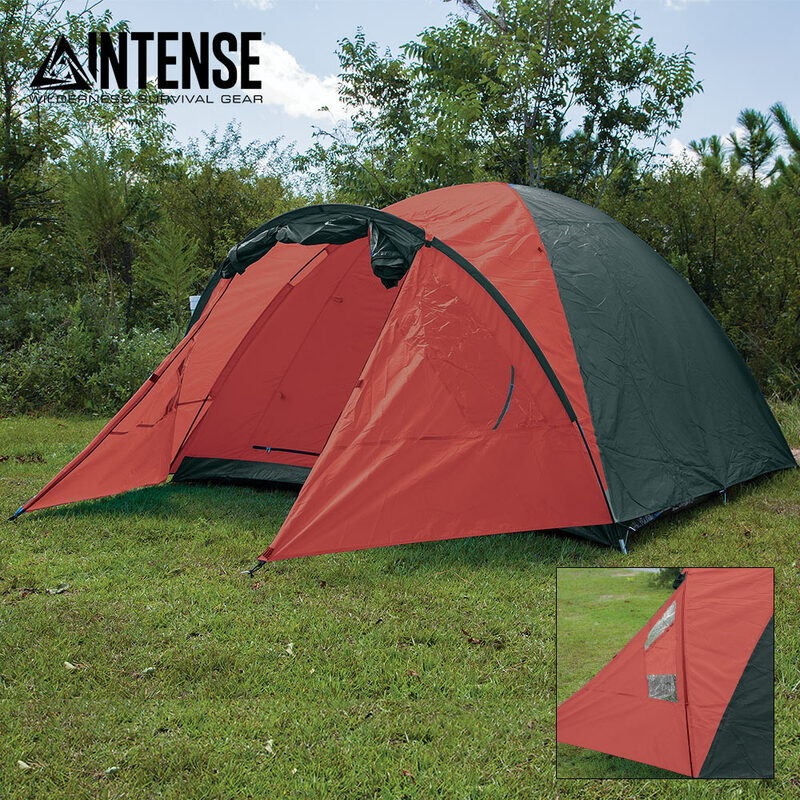 The Intense 4-Person Dome Tent is surprisingly affordable, yet it boasts a level of quality that rivals tents priced two and three times as high. So what are you waiting for? With this extraordinarily versatile, rock-solid tent in your pack, "home" is anywhere you roam. Order today and hit the trail with your family or a group of fellow outdoor adventurers! I used this tent the other day, just me and my wife. We camped in the Rocky mountains. There was no foul weather so I can't say if it holds up under bad weather conditions. 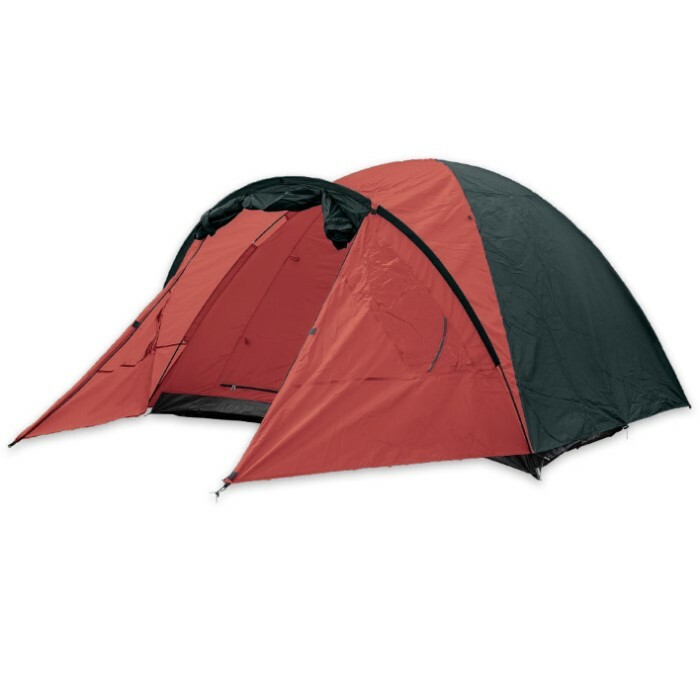 most tents of its size are much more expensive. Pros: Price Quality seems good enough. The size of the tent in package is pretty small (good) for the size of the tent. I fit it in my framed backpack for the hike to our campsite as well as all the other essentials. Cons: The "porch" is not fully enclosed and is not very big. We didn't even attempt to put chairs in it. It is more of an entryway to the tent, or just the excess of the rain proof coverving. The poles seem to be fairly cheaply made. but they did their job. i just wouldn't trust them for the long haul. The stakes are very cheap simple metal and don't hold very well depending on the earth you are putting them in. (but there are a lot of them) There are no instructions of any kind that I could find. not a big deal, tents are fairly simple. But this tent hast a lot of fastenings that you just have to guess on what to do with. Over all It worked well. For the price (I got it on sale for about $40) it is a great deal.